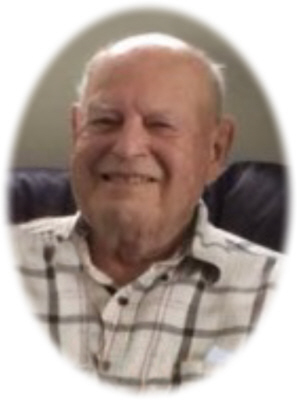 Rolla L. Gruesbeck age 87, of Ovid, MI, passed away Thursday, April 4, 2019, at his home surrounded by his family. Visitation will be held at Smith Family Funeral Homes - Houghton Chapel, Ovid, MI, on Monday, April 8, 2019 from 1:00 until 3:00 P.M. with a brief Memorial Service to follow at 3:00 P.M. with Bonnie Wood officiating. Burial will take place at a later date at Middlebury Township Cemetery, Ovid, MI. Rolla was born in Morrice, MI on July 23, 1931, the son of Arthur and Cordelia (Peet) Gruesbeck. He married Colleen Swender on June 28, 1953, in Ovid, MI. Rolla retired from the Ovid Elsie School System from the maintenance department in 1996. He was an avid gardener and fisherman. He enjoyed restoring many things including antique tractors, Cushman Scooters, and bicycles. Rolla loved time spent with his family, especially his grandchildren. He never met a stranger and was a friend to all. Rolla is survived by his wife Colleen Gruesbeck, children: Sue (Rick Troub) Plowman, Chris (Randy) Anderson, Lynn (Lois) Gruesbeck, grandchildren: Eric (Mary) Plowman, Nicholas Plowman, Adam (Alissa) Plowman, Jacob Anderson, Scott Anderson, Lindsey (Kevin) Bell, Katie (Joel) Roseberry, great grandchildren: Molly, Olivia, Aubrey, Logan, Abby, brother Vaun Gruesbeck, sisters: Hattie Spencer, Grace Luke, and Marjorie Behrens. He is also survived by many nieces and nephews. He was preceded in death by his parents, brothers: Vern, Rolland, Myrl, Earl, William and Wayne and sisters: Lena, Margaret, and Ilene. If you wish to make a memorial contribution, they may be made to Shepardsville United Methodist Church, 6990 Winfield Road Ovid, MI 48866 or to a Charity of the Donor's Choice. Online condolences can be sent to www.smithfamilyfuneralhomes.com. The family is being served by Smith Family Funeral Homes - Houghton Chapel, Ovid, MI.